His idea of a perfect picture day isn't so perfect after all. At least that's what he thinks. 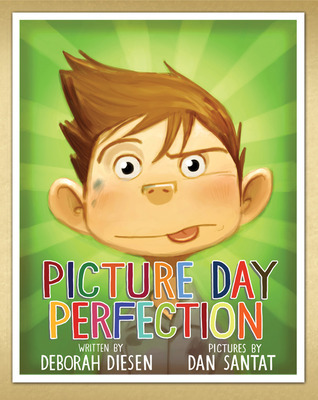 Fun readThis is a cute book about the pain of picture day. I feel him! My pictures always came out weird too! Loved it! Perfection is in the eye of the beholder ... a real lesson on assuming things and point of view. Picture Day is a day when you want to take the perfect picture. That doesn’t come easily! In fact, the boy in this book has been planning his Picture Day for months. But nothing seems to be going well at all. First is the bedhead hair that makes his brother laugh, then his favorite shirt is stained and smelly, and that all leads into the incident with the syrup at breakfast. The day continues this way and when he gets to school he starts to get into trouble with how he is acting. He won’t practice his smile, choosing instead to stick out his tongue. He sends paint flying during art. He doesn’t get a comb to fix his hair. In the end though, it all comes off just like he planned, or does it?Diesen has a wonderful kid-like sense of humor that is very evident throughout this book. Her timing is great, the story will have everyone laughing. Readers will figure out what is really happening in this book just as the author decides to reveal it. Then the entire book still makes sense, but in a different way. It makes for a great read.Add in Santat’s vibrant and equally funny art and you have a real winner. Santat captures the funniest moments in the text with great style. The image of the syrup incident is my favorite but I also love the picture taken at the end of the book. Funny, pure silliness and just right for the start of a new school year. Try this one out with older elementary students since they will love the humor too. Appropriate for ages 5-8. A boy sets out to get the perfect picture on picture day (perfectly awful that is). He has the bedhead, the dirty shirt, dirty face, boring background and is ready with a scowl on his face. Unfortunately, a smile slips through and ruins his perfect awfulness. In the end he looks forward to trying again next year.At first this book reminded me quite a bit of Alexander and the Horrible...Day. Everything that could mess up his picture day happens. But then as you get to the end you realize this was all part of the boy's diabolical plan which makes it more fun.The illustrations are beautiful, quirky and fun. This book is advertized for ages 4-8. Why four year olds? They most likely don't have picture days. I would recommend this for all elementary age children who would enjoy and understand the ironic picture day humor. Anyone who has ever had a school picture taken--and that would be all of us--is sure to remember carefully choosing the right outfit and hairstyle and practicing smiling in front of the mirror to achieve the right look. After all, school photographs, it would seem, last forever, and can come back to hunt someone even when he/she has left behind the acne and big hair that was popular decades ago. All sorts of mishaps lead the narrator to have the worse possible photograph to be taken--until he smiles. Young readers will enjoy the twist at the end and the humor throughout the book. The Adobe Photoshop illustrations snap him at his worst in his favorite soiled shirt and syrup-soaked head. SIGH! I wish I could blame some of my class photos on my own deliberate sabotage, but sadly, I thought I looked good at the time. It's Picture Day. We meet our main character, who has been planning this day since last year. But nothing SEEMS to be going right. He wakes up with bed head, his shirt is at the bottom of the laundry, he gets syrup all over... the list goes on and on. But then..... Well, I can't give away the whole book!!! It has a great A-ha moment with a twist! Boys will love this young hero and kids will enjoy seeing all of the things that happen to our main character on Picture Day. Great story to add to your picture book collection! After all his careful preparations for school picture, his photo still comes out good. Large, appealing illustrations of a boy trying to sabotage his school photo. You put Dan Santat in anything and it's guaranteed I'm going to love it. Deborah Diesen did a great job on this wonderful story, and Dan's illustrations made it all super fantastic! I loved it! I loved the illustration in this book! There were many pictures to look at it and it helped explained the story. I think students can easily relate to this book because every one knows that picture day can be stressful. I just think this is a fun and engaging book for younger children. E DIEGR: NLexile: 570Our main character is ENTHUSIASTIC for picture day at school. When everything seems to go wrong will his picture turn out alright? As he REFLECTS back on how his picture day goes he is ready to work on things for next year. This is a funny book that would be sure to entertain children as they prepare for school pictures. A few (many?) adults may identify with the main character, as well. Clever, different, humorous without being rude. The art is attractive and enhances the story, as it should. Our main character is ENTHUSIASTIC for picture day at school. When everything seems to go wrong will his picture turn out alright? As he REFLECTS back on how his picture day goes he is ready to work on things for next year. This was a fun, silly book that I read with come great Camp Divers! Most of us (I'm guessing) are in the ranks of those who dread staged photo shoots and here is a book that hilariously fleshes out the drama of the day. Definitely for an audience of K-3 and up. This book was a lot of fun, but the ending was a little unclear to me. It was easy to get past that because the bulk of the story was fun. Illustrations are fabulous. Big hit with grade 6. Funny, loved the twist. The kindergarteners found this very entertaining, though I'm not sure they really understood the little boy's plan. I think kids just a bit older would "get" it better. Professional Review:School Library Journal( October 01, 2013; 9781419708442 ) Gr 1-3-Bold, exaggerated images done in Adobe Photoshop set the comedic stage for this story of picture-day preparation, which for the narrator began months in advance. All the preplanning culminates at the start of the book on picture-day morning with severe bed head, a favorite shirt rescued (stained and smelly) from the bottom of the hamper, and a sticky maple-syrup incident. Things continue on in this vein throughout the school day. Readers will wonder about the narrator's choices considering his professed devotion to taking the perfect picture. Carefully worded text gives away nothing, but as the photographer prepares his camera the real plan for the day comes clearly into focus. The child's idea of the perfect picture may look quite different from what his mother had in mind, and it is still not easy to orchestrate the outcome of a photograph. Colorful yearbook-style endpapers are fun to pore over and even include a place to insert one's own picture, though this feature will be compromised by most library processing. This slapstick picture book will appeal most to school-age kids who will get the jokes peppered throughout the text and the visuals.-Julie Roach, Cambridge Public Library, MA (c) Copyright 2013. Library Journals LLC, a wholly owned subsidiary of Media Source, Inc. No redistribution permitted. (c) Copyright Library Journals LLC, a wholly owned subsidiary of Media Source, Inc. No redistribution permitted.My Review: I agree with the review above that no parts of the main character's mischievous plans were given away throughout the book until the end. It was a surprise ending that many students would find entertaining and unexpected. Diesen, D., & Santat, D. (2013). Picture Day Perfection. New York: Abrams Books for Young Readers. This is the story of a young boy who is after the perfect school picture. He has planned and prepared to make sure that he gets the best picture. However, after a serious case of bed head, a syrup disaster and many other messy situations, will he be able to get the perfect picture? As it turns out he does not get the perfect picture. However, his perfect picture is not exactly the same thing his mother would consider a perfect picture. He wanted his picture to be bad, messy and embarrassing but at the last second he smiled and it ended up being the picture his mother loved. Activity: I would give the children a worksheet with two empty boxes (like picture squares in a yearbook). I would ask them to think about what kind of picture they think this boy wanted to take for his perfect school picture and draw it on one of the squares (The boy wanted a bad, messy picture so it would be fun to see what they drew). For the 2nd square, I would ask them to think about what their perfect school picture would look like (good or bad) and draw it in the other box. After they drew their pictures, I would ask them to write the story behind each picture, as well as how and why each picture ended the way it did. It's picture day, the day most kids dread, but one boy is determined to have the perfect picture. One mishap after another leaves him in a less than desirable state though. Paint-splotched scowling face, wild hair, slumping in a stained shirt. Perfect. The boy is now ready for his mischievous photo, one which his mom will hardly appreciate. At the last moment though, his own thoughts of victory betray him as he lets out the biggest smile. Dan Santat's style of bold, cartoonish expressions works perfectly for a story on picture day. Faces look really funny, particularly the ones on the boy; many will recognize the Grinch smile. The designs constantly remind us of the photography context. Some pages have photographs as panels, while others look like they caught a moment on film, and finally the blinding flash at the end hides the final reveal. Even the end papers feature photos of the children, to which we can add our own. Picture Day Perfection is the perfect book on the subject, because when the boy attempts to create the worst photo, ironically, he produces the best. As we all know parents and classmates put a lot of pressure on kids for the perfect picture on school picture day and this story is a about a rotten little boy who is determined to have his most perfect picture yet but his version of perfect and his mother's version of perfect are two totally different things. Although the little boy tries his hardest to ruin his mother's perfect picture he ends up making the picture his best yet for his mother.This book was super cute but I did not love it per say. Although the story was cute and funny it just did not really draw you in, it had you basic picture day disasters with no twists or turns. Very Predictable. The illustrations were by far the best part of the book. Each picture was very detailed, colorful, and lined up with the story perfectly. This book could really be wordless and you would know just from the illustrations exactly what was happening from page to page. Picture Day Perfection is about a little boy who is nothing but ready for picture day at school. The unfortunate events that happen up until the picture and not making his day easy however. He wakes up with bed head, has a stain on the shirt he is going to wear, spills syrup all over himself at breakfast, gets in trouble on the bus and many more incidents happen. By the end of the story, the little boy ends up hating his school picture. The illustrations in this book are stunning to look at while reading the story. Dan Santat does an amazing job of making the illustrations tell the story in a different way than the story was written. This book could be used as a read aloud in the classroom. Also, the teacher could read this to the students the week of picture day and have them create their ideal picture day picture on a drawing and then hang them on a wall of the classroom. A young boy prepares for school picture day. He wants to have the perfect photo but everything seems to be going wrong. His hair's a mess, his shirt is dirty, he gets paint all over him at school. What a twist when you realize that's exactly what he wanted! His perfect picture is not the typical clean-cut image a mother wants. The trick is on him though. Just before the camera snaps his picture, he pauses to relish in how perfectly his plans have been executed, and he grins! SNAP! His smile is so bright it ends up being his best picture ever!This is a really fun story highlighting all the possible mishaps a child can run into on the day of school pictures. I liked that there was a twist in the meaning of a "perfect picture", and I like the realization (after the fact) that he was intentionally causing havoc to grunge-up his appearance. This book is a lot of fun to read. It reminds me of some of the awful school pictures I had taken through the years. Although, I was always trying to have my pictures turn out all right. Even as I've gotten older (teachers still have to have their pictures taken), it seems the harder I try to look good, the worse it comes out.Dan Santat's illustrations are terrific. The endpapers are yearbook style portraits with one frame in the back for the reader to insert a favorite school picture. Although the copy I'm reading is borrowed from the library and you can't really get to the picture frame. As the day goes along for the boy in this story, the chances of a nice looking picture are getting more and more remote. His hair is messy, his shirt is wrinkled and dirty, he makes a mess in Art class, and he has a nasty scowl on his face. Read on to see how his best laid plans play out.